A few weeks ago a friend asked if I would make him some beef jerky to take with him to Africa. After scouring tons of recipes online I finally chose this one based on the ingredients, reviews, and cost. I promise it will A) make your house smell AWESOME B) satisfy every savory craving you have and C) inspire you to never again buy store bought jerky. EVER. I look forward to making it again before we leave for Uganda! 1. Place the meat in the freezer for 2 hrs so it's easier to slice. 2. Take meat out of the freezer and slice into 1/8" strips and layer them in the bottom of a large bowl. 3. Whisk together the soy sauce, Worcestershire, liquid smoke, brown sugar, salt, pepper, meat tenderizer, garlic powder, onion powder, and paprika in a small bowl. (Go ahead, stick your finger in the bowl and taste it. You know you want to). 4. Pour liquid over the meat and gently turn using your hands to ensure that all meat is evenly coated. Cover with Saran Wrap and marinate in the refrigerator overnight. 5. The next day remove the meat from your refrigerator and arrange on dehydrator trays. (Our 3.74 lbs of meet filled 6 trays). 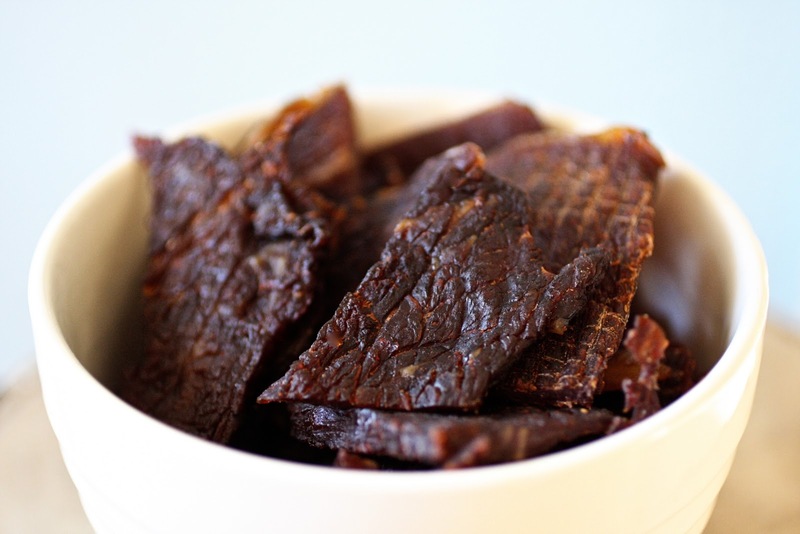 Dry meat on your dehydrator's highest setting for at least 4-6 hours or until done. (Be sure and rotate your trays every 2 hours). 6. You'll know you're jerky is done when it's no longer pink in the middle and it bends (if it breaks you've overcooked it). ENJOY! PS, this is the Food Dehydrator we use and love it! Original recipe adapted from here. Great Post! I love homemade jerky! My dad hunts, so growing up we always had deer jerky. I'm new to your blog and I must say I am in love with it! Thanks for all the great posts! My tummy is now yelling at me : ). I do not own a dehydrator and would love your recommendation on one. Bet this is even better than Fritz's in KC cuz it is made with love AND it is much cheaper. Fritz's sells for $16 per lb. Another cottage industry springs to life! We bought eachother a dehydrater for christmas this year and just made our first batch of jerky a few weeks ago. Excited to try your recipe! I'm working on my second batch of Jerky using your post. The first batch was gone in 1 day. I have 6 pounds of meat sitting in the refrig right now. ﻿ I had a question for you, how long should this jerky stay good for if kept in a sealed container? We talking days, weeks, months? Thanks! @jemima, around 5-7 days, but it usually doesn't last that long. ideally we'd like to heat seal it so it stays fresh for up to months at a time. glad you're enjoying our recipe! will be making another batch before heading to ethiopia in a couple of weeks.